LiveRez Founder/CEO Tracy Lotz cuts the ceremonial ribbon, as LiveRez officially commemorates the opening of its new headquarters in Eagle, ID. At 11 a.m. on Friday, January 31, LiveRez officially commemorated the opening of its new headquarters in Eagle, ID with a ribbon cutting ceremony. Surrounded by his friends and colleagues, LiveRez Founder/CEO Tracy Lotz did the honors. In attendance were local officials, including Eagle Mayor Jim Reynolds and Eagle Chamber President Gretchen Gilbert, representatives from Eagle businesses, local media and more. Also in attendance was LiveRez’s first partner, All Star Vacation Homes CEO Steve Trover (who recently joined the company as its Chief Strategy Officer). In addition to the ribbon cutting, LiveRez will hold an open house tonight from 6 p.m. to 9 p.m. At the open house, guests will be treated to live music from the Kim Stocking Band and food from local eateries, among other activities. They’ll also get an inside look at the company’s 11,000 square foot complex. 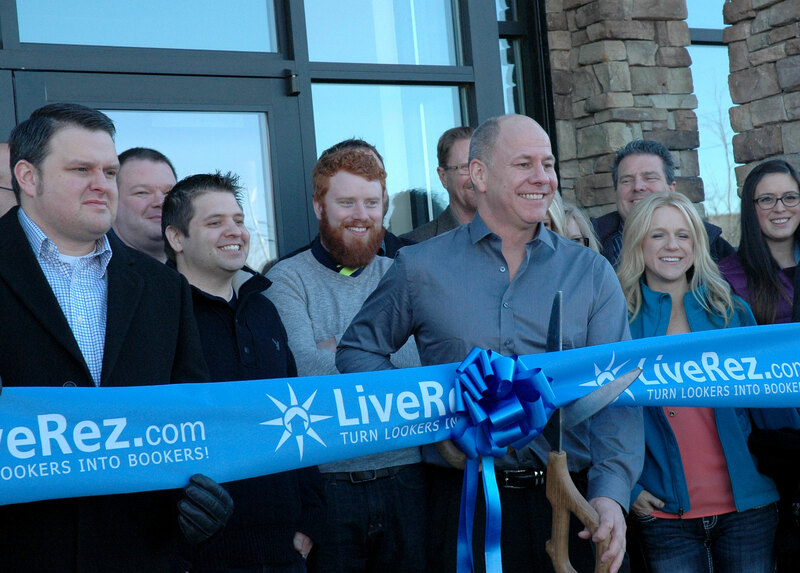 After the ribbon cutting, Lotz spoke briefly about the history of the company, how he found the vacation rental industry (and the Internet) in 1994, working with Trover and All Star Vacation Homes to enable them to take online bookings, and officially launching the LiveRez software in 2008. You can see the full video below.